I can offer financing or a rental program if you are resident of the U.S.
My most popular program is a 0% program, with introductory rates of 0% for up to 12 months and no penalty for early pay off. Interest rates begin at 11%. Rates are usually set with immediate approval, and you will receive the agreement by mail. Purchase your chamber for no money down and pay it off anytime you like. Not sure if your condition will benefit from HBOT? Only need treatment for a month or two? Try our chambers BEFORE you purchase. Typical protocol to determine if you will benefit from HBOT is 40 consecutive sessions of 60 to 90 minutes each. This can be done within a 30 day period with 2 sessions daily, or within a 60 day period as 1 session daily in the convenience of your home. Renting a chamber for 30 to 60 days will allow you to confirm the benefit for your needs. 100% of your chamber rental fees apply to the purchase of your chamber. 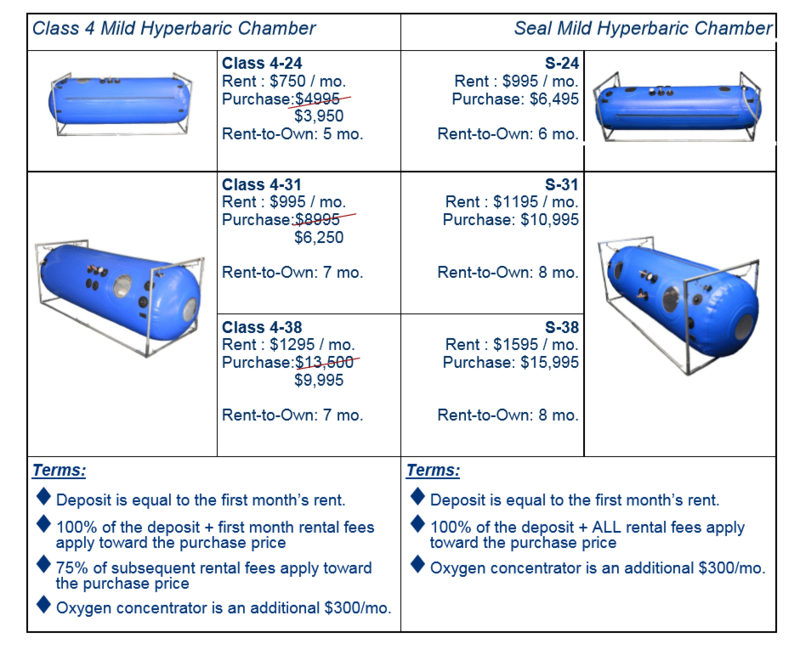 HYPERBARIC CENTRAL’S RENT TO OWN PROGRAM — HOW DOES IT WORK? Recurring payments for the Rent-to-Own program require a valid credit card (MC, Visa, Discover).